Bishop Joseph Hii Teck Kwong was born on June 25 1965 in Sibu. He attended local schools in Sibu and then entered St. Peter’s major seminary in Kuching, in 1986, to study philosophy and theology. He was ordained a priest in 1993. Since his ordination he has ministered as follows: 1993 – assistant priest at St. Anthony’s Church, Sarikei; 1993-1997 – assistant priest at St. Herbert’s Parish, Song and Mary Immaculate Conception Church, Kapit; 1997-1999 – studied for a licentiate in spiritual theology at the Teresianum College in Rome. Since 1999 he has been parish priest of Mary Immaculate Conception Church, Kapit. 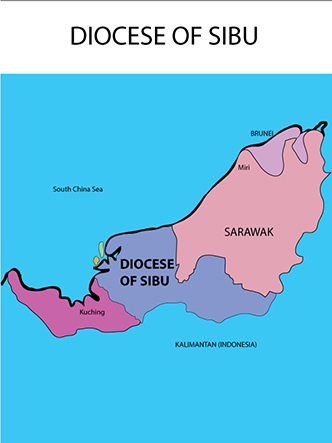 On Jan 25 2008 he was Appointed as the Auxiliary Bishop of Sibu, Malaysia .And ON December 24th 2011 he was Appointed as the Bishop of Sibu, Malaysia.